It's Fall for sure, now, and time to get your woolens out of the cedar chest. I hope you have a nice scarf, something handmade. I'm sure I have mentioned it before, but knitting a scarf is a very rewarding and pleasant task. All the lovely yarn runs through your hands and over the needles into the scarf, and then around someone's shoulders. I traded a knitted scarf I'd made for a bag of raw wool at an art performance a short while back, which was a piece of good fortune as I have more scarves than necks. 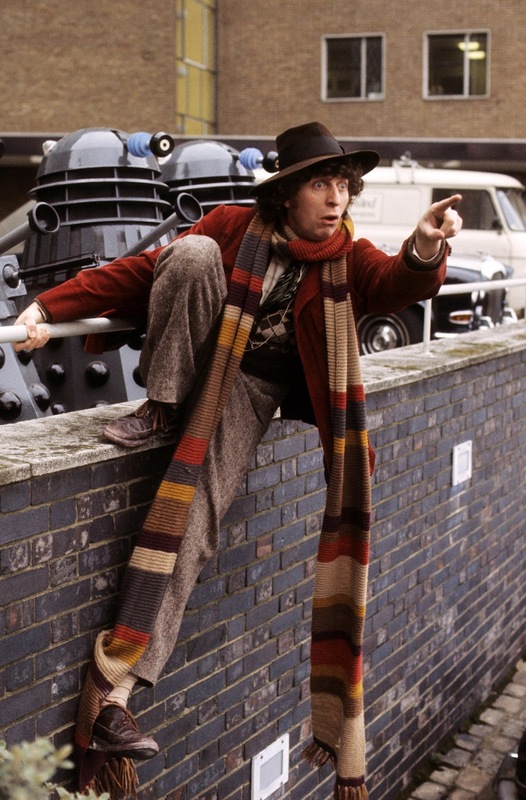 Baker himself suggested many aspects of his Doctor's personality, but the distinctive scarf was created by accident. James Acheson, the costume designer assigned to his first story, had provided far more wool than was necessary to the knitter, Begonia Pope, intending for her to choose a suitable color. However, due to miscommunication Pope knitted all the wool she was given. It was Baker who suggested that he wear the ridiculously long scarf, which he did once it had been shortened a bit to make it more manageable.